December 30, 2011  It's tempting to say what a snake-bit year this was, a year when American troops were lost abroad, a year of economic struggle and cynical politics. But it was also a year when troops came home, and people started new jobs. Steve Inskeep says it's to soon to judge 2011. December 24, 2011  From natural disasters both at home and abroad to political uprisings in the Middle East, weekends on All Things Considered looks back at the year's biggest stories, as heard on NPR. 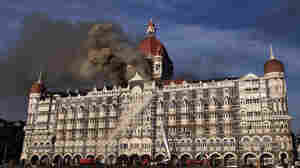 December 23, 2011  When a Mumbai hotel was besieged by terrorists in 2008, something extraordinary happened: Workers didn't flee. They stayed behind to help save guests at the risk of their own lives. What could possibly explain it? A new study attempts to answer that question. December 23, 2011  Robert Siegel speaks with our regular political commentators, E.J. Dionne, of the Washington Post and Brookings Institution, and David Brooks, of the New York Times. 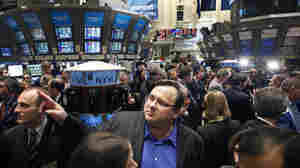 They discuss the two-month extension for a tax break and unemployment benefits signed into law. December 17, 2011  Today, the Senate approved a $1 trillion bill to fund the government and a two-month payroll tax cut extension. Weekends on All Things Considered host Guy Raz speaks with James Fallows of The Atlantic about the last minute deal and other top stories from the past week. December 12, 2011  President Obama appeared on the CBS show 60 Minutes Sunday night to answer questions about his prospects for re-election. Meanwhile, Republican presidential contenders took part in another debate over the weekend, where the presumed frontrunner, Newt Gingrich, defended himself against verbal attacks from the other candidates. December 10, 2011  On Friday, British Prime Minister David Cameron vetoed an E.U. plan to solve its economic woes, which caused a severe rift among Europe's greatest powers. Weekends on All Things Considered host Guy Raz speaks with James Fallows of The Atlantic about the Eurozone crisis and other top stories from the past week. December 5, 2011  Linda Wertheimer speaks with NPR's Cokie Roberts about the latest in politics, including a shakeup in the Republican presidential race. December 3, 2011  The couches of late night TV shows have become the new must do on the campaign trail for a presidential candidate. Weekends on All Things Considered guest host Rachel Martin talks with NPR's political junkie Ken Rudin about how getting a laugh on Leno or Letterman could help a candidate's image. Week In News: What's Next For Cain? December 3, 2011  Following the suspension of Herman Cain's presidential campaign, are the other GOP candidates awaiting his endorsement? Weekends on All Things Considered guest host Rachel Martin speaks with James Fallows of The Atlantic about that story and others from the past week. November 28, 2011  Egyptian voters in Cairo, Alexandria and several other major cities are voting Monday in the first stage of the country's parliamentary election. Turn out is heavy and so far there has been no major violence. Melissa Block talks to NPR's Lourdes Garcia-Navarro. November 27, 2011  Last year, the Supreme Court ruled that the conditions in California's overcrowded prisons violated the Eighth Amendment's ban on cruel and unusual punishment. Host Audie Cornish hears more from Ohio State law professor Douglas Berman, who says the popular "tough on crime" mantra helps explain why so many American prisons are over-capacity.